There’s a kitschy-cool ambiance at this Inner Sunset restaurant, with a long bar up front, a checkerboard tile floor and a moody, red-tinged glow cast through stained glass lampshades. The meat and fish options are plentiful, including beef, chicken, lamb, catfish and shrimp. 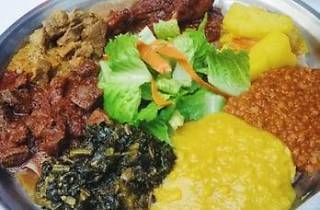 The specialty is the special kitfo: finely chopped flank steak mixed with sautéed greens, cheese and clarified butter. 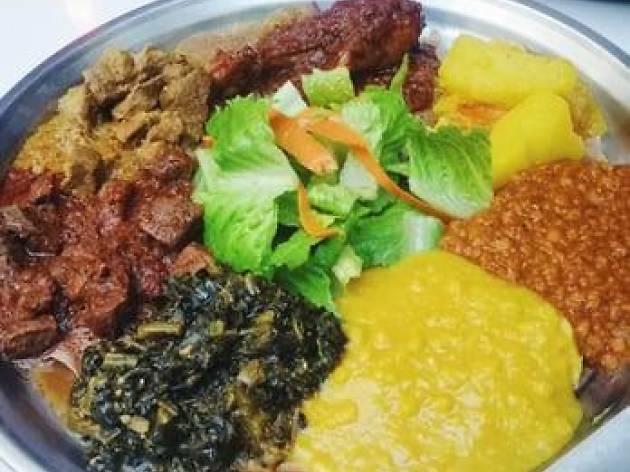 The house sampler, however, is a popular favorite, featuring six vegetarian dishes, salad and injera for anywhere from two to five people. (Try the yogurt and cheese, both made in-house.) Wash down the spiciness with tej (honey wine) or an Ethiopian beer.